Hundreds of daffodils appear each year (of course) in the field behind my house. Until I bought the land, it was pasture for a small herd of cattle. 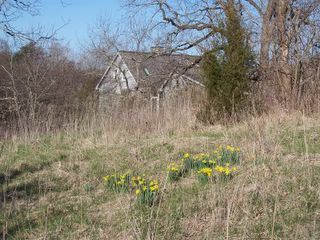 But the presence of the daffodils (and there is other evidence: a cistern, the occasional discovered brick, the level path down to the creek) suggests that there was a house here at one time. Who lived in that house? I wish the land could whisper their names.